Roots + Wings School of Art and Design nurtures and encourages the natural creativity within people of all ages through innovative art and design education, community collaboration, and a focus on both local and global impact. Starting with pre-school through high school and beyond, students at Roots + Wings School of Art and Design learn the principles of design and art expression while applying innovative and creative problem-solving skills to real-life situations within their communities. Want to know more about the who, what and how of Roots + Wings? Take a moment to peruse our ABOUT menu. Visit our Weather Update page for any weather related changes or offerings! Our Visual Arts Preschool is a school year program that fosters creativity and promotes early development in problem solving, critical thinking, cognitive concepts, social interaction and increased physical health through art-making and the exploration of the world’s many forms of visual art and design. We offer Weekly Classes and Spring and Summer Creativity Camps for our youngest makers to enrich their development outside of school. We also offer customized Birthday Celebrations and Custom Lessons for children 3 and up! 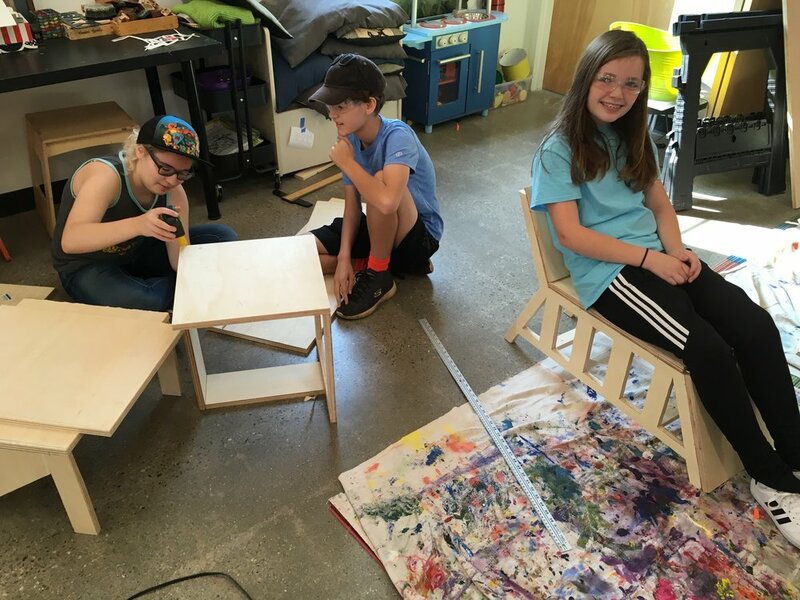 Our After-School Community Design Lab Programs—offered at Claxton + Vance Elementary, and the R+W Creative Campus —engage students in academics, critical thinking and innovation through principles of art and design, community enrichment, culture and movement. Birthday Celebrations and Portfolio Intensives are also options! We are proud to offer Adult Classes and Workshops, along with unique Community Classes and Events for various ages at our Creative Campus. Our instructors work with students on exploring a variety of mediums, tools and techniques. Our Private Event options can be customized for your party, fundraiser or other creative idea! Our Adult Classes and Making Labs are open to people of all experience levels looking to expand their capabilities. We also offer unique and customized Teacher Training, Curriculum Consulting and Residencies for schools and organizations. for ages 5-7 and 8-10 in April and May!! Don’t miss out on Summer! REGISTRATION IS OPEN for our Summer Creativity Camps and Design Studios!! AND have opportunities for Assistants in Training and Internships all summer long. AND check out our NEW SUMMER K-BOOST class for rising kindergartners! Bring the whole family to kick off your weekend on every third Saturday of the month! Any age is welcome as we engage in collaborative projects together! NEXT UP: Art for our Yard!!! Come hang out the 1st Friday of each month and make stuff with us! Come solo or with your buds. Hunker down in our studio space and make something awesome! NEXT UP: Art you can Mail! We have a few new spaces in our different After-school locations! Engaging, nurturing and SUPER fun! We have been hard at work finding ways to make our art + design classes accessible to vulnerable communities across Asheville. Take a peek at what we are up to and support our efforts however you can! Jump on our 2019-20 wait list AND check out our unique afternoon option for 2019-20!! Check out all that we do through our amazing visual arts preschool program!! Looking for an event venue, studio or creative space for your business? Are you searching for a unique space to rent for yourself, a company or an organization? 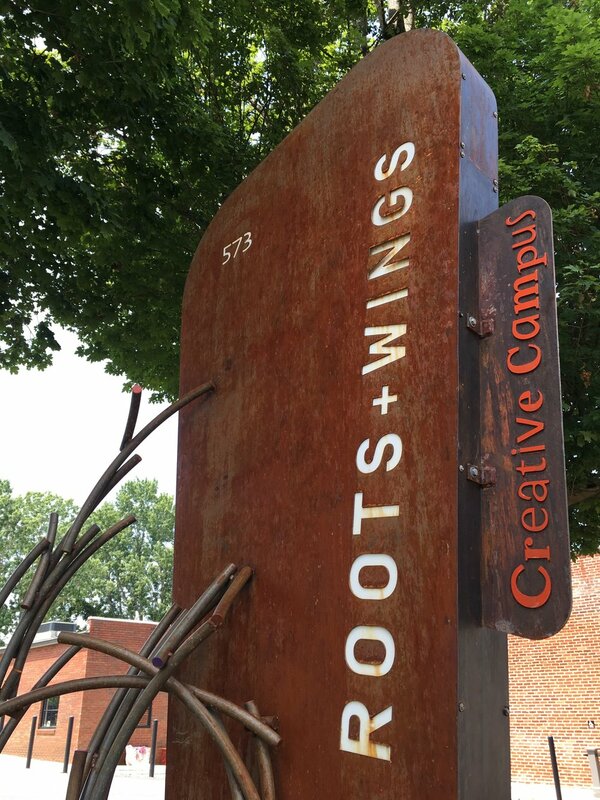 Take a look at the spaces we have available at the Roots + Wings Creative Campus. Amazing facilities in the sweet Oakley neighborhood of Asheville. We have a few unique and affordable spaces remaining for rent on an hourly or monthly basis! There is even a professional sound studio on site. Come join our community!